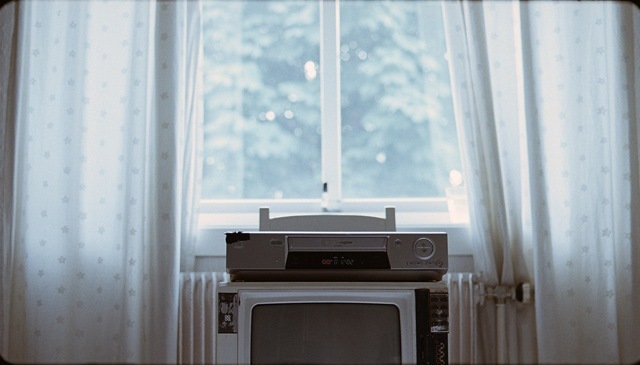 The only things moving in Jon Eirik Kopperud’s film «Smart Engine» are some obscured branches observed through a window as the wind animates them in pulsing sweeps – occasionally also rustling a pair of transparent curtains draped along the edges of the window – and the timer on a vintage VHS-player, letting us know that a recording is being committed to tape. But the TV-set that the video-player rests on top of is turned off. We are left without any information about what exactly is the content of this recording. Like the bland interior – effaced by a soft light that spreads from the window – where the prosaic set-up of equipment takes center stage, the broadcast being recorded is without qualities; it is a recording mediated via generic indicators: a TV hooked to a VHS-player in record-mode and the timer’s slow count. You notice the worn frame around the TV-screen, the chapped left corner of the VHS-player, the high-pitched clacking purr from the 35mm camera eating through a reel of film as it records machines recording. The air is dense with the presence of recording media. This atmosphere bleeds from the image and the speakers and into the space where the film (now transferred to a digital format) is projected, creating a larger ambient situation that is no longer contained in, or framed by, the original image but has grown to include the hum and beam from the projector. 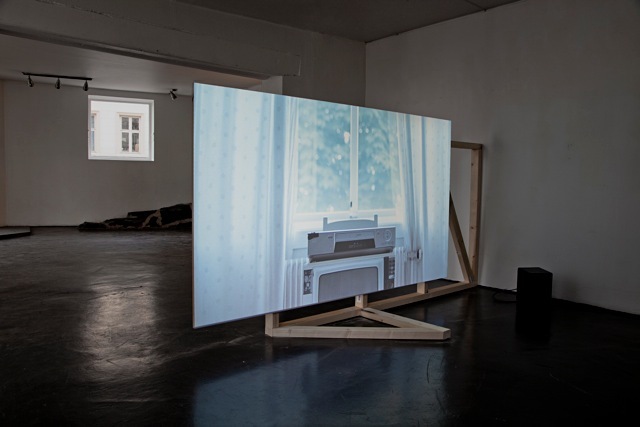 Kopperud’s aggregation, or layering, of different media underscores the shared function of these technologies – that of registering information, or witnessing. Despite its highly saturated and particular motif Kopperud’s film blurs rather than exhibits the material properties of a specific medium, proposing this witness-function to exist as a kind of spectral object that can be thought independent of its various incorporations.